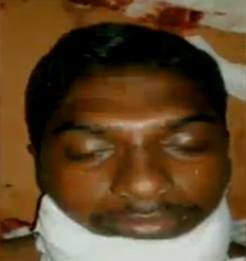 Swathi’s Murderer Ram Kumar arrested in Tirunelveli. Breaking : Chennai techie Murder Case: Accused has been arrested from Tirunelveli. The accused has identified as Ramkumar from Sengottai from Tirunelveli. The suspected assailant who killed Infosys Employee S. Swathi at the Nungambakkam Railway Station in Chennai on June 24 was been arrested in Tirunelveli late on Friday night. A couple of Swathi’s friends told the investigators that she was aware that she was being stalked by the suspect, who finally killed her. On Friday last, Swathi was waiting at platform number 2 of the railway station to board a train to work. Sources at the railway station said a man approached her as she was waiting, and soon, an argument broke out between them. Subsequently, he took out a sharp weapon and hacked her to death. What is this? Does the article even make sense? I have read other article in the same website, the exposition, detail and description of evidence lacks in nearly all of them. I would suggest you guys to look at this https://owl.english.purdue.edu/owl/resource/735/05/, http://homeworktips.about.com/od/paperassignments/a/How-To-Write-A-News-Article.htm, http://www.jhuapl.edu/education/elementary/newspapercourse/forstudents/tips.htm. Please go over these links and understand them before writing any article or sharing them in the web.